American test pilot mission specialist astronaut 1998-on. US Army. Status: Active 1998-on. Born: 1960-05-05. Spaceflights: 2 . Total time in space: 178.40 days. Birth Place: Binghamton, New York. SPECIAL HONORS: Russian Medal of Merit for Space Exploration (2012); Doctor of Science (honoris causa), Oklahoma Christian University (2012); American Red Cross Hero in Space Award (2010); Fédération Aéronautique Internationale Yuri Gagarin Gold Medal Award (2010); American Astronautical Society Flight Achievement Award (2008); NASA Superior Accomplishment Award (2002, 2004, 2005 and 2008); Order of St. Michael (Bronze Award) from the Army Aviation Association of America (2007); NASA Group Achievement Awards:� Russian Liaison Support Team (2001) and Global Positioning System (1997); Gamble Award for Excellence in Experimental Flight Testing (1995); Team Leader of the Georgia Tech Aerial Robotics Design Team (1992); Veterans of Foreign Wars Outstanding Spokesman for Freedom (1990); U.S. Jaycees Ten Outstanding Young Men of America (1989); 25th Infantry Division Flight Safety Award (1986 and 1989); Distinguished Graduate of the U.S. Army Flight Training Course (1984).� Member of the Society of Experimental Test Pilots, the Society of American Military Engineers, the Association of the United States Army, the Army Aviation Association of America, the West Point Association of Graduates and the Georgia Tech Academy of Distinguished Engineering Alumni (2007). EXPERIENCE:� Colonel Wheelock received his commission as a Second Lieutenant in the Army Infantry from West Point in May 1983.� He entered flight school in 1984, graduated at the top of his flight class and was designated as an Army Aviator in September 1984.� He served in the Pacific Theater as a combat aviation Section Leader, Platoon Leader, Company Executive Officer, Battalion Operations Officer and Commander of an Air Cavalry Troop in the Ninth U.S. Cavalry.� He was later assigned to the Aviation Directorate of Combat Developments as an Advanced Weapons Research and Development Engineer.� He earned a Master of Science degree in Aerospace Engineering from Georgia Tech in 1992 with research in the areas of hypersonic and high-temperature gas dynamics, flight stability & control and robotics.� He is a graduate of Class 104 from the U.S. Naval Test Pilot School and was subsequently assigned as an Experimental Test Pilot with the Army Aviation Technical Test Center (ATTC).� His flight testing was focused in the areas of tactical reconnaissance and surveillance systems in a variety of fixed and rotary-wing aircraft.� He served as Division Chief for testing of Army Scout/Attack aircraft and weapons systems in support of tactical operations in the Balkans.� Colonel Wheelock's work as a test pilot culminated in his assignment as Division Chief for fixed-wing testing of airborne signal and imagery intelligence systems in support of the National Program Office for Intelligence and Electronic Warfare.� He completed his military career as the Commander of the U.S. Army Space & Missile Defense Command - NASA Detachment.� Colonel Wheelock is a veteran of three combat tours and 38 combat missions in support of Operation Enduring Freedom.� He is also a graduate of the Army Airborne and Air Assault Courses, the Infantry and Aviation Officer Advanced Courses, the Combined Arms Services Staff School, the Material Acquisition Management Course and the U.S. Army Command and General Staff College. Colonel Wheelock is a dual-rated Master Army Aviator and has logged more than 7,000 flight hours in 46 different rotary and fixed-wing aircraft and spacecraft.� He is also an FAA-rated commercial pilot in single- and multi-engine land craft, rotorcraft and gliders. NASA EXPERIENCE:� Colonel Wheelock reported for Astronaut Candidate Training in August 1998.� He was assigned to the Astronaut Office International Space Station Operations Branch as a Russian Liaison, participating in the testing and integration of Russian hardware and software products developed for the station.� He worked extensively with the Energia Aerospace Company in Moscow, Russia, and has led joint U.S./Russian teams to the Baikonur Cosmodrome in Kazakhstan to oversee bench reviews, inventory, loading and launch of the first four unmanned International Space Station (ISS) resupply capsules. 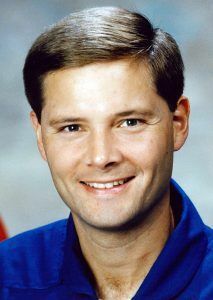 In 2001, Colonel Wheelock assumed duties as the Crew Support Astronaut for the International Space Station Expedition 2 and Expedition 4 crews.� He was the primary contact for all crew needs, coordination, planning and interactions and was the primary representative of the crews while they were on orbit.� In August 2002, Colonel Wheelock was assigned as a Capsule Communicator (CAPCOM) in the Mission Control Center in Houston.� In this role, he was the primary communication link between crews on orbit and the ground support team in the Mission Control Center.� He was the lead CAPCOM for ISS Expedition 8. In January 2005, Colonel Wheelock was assigned to the Gagarin Cosmonaut Training Center (GCTC) in Star City, Russia, as NASA's Director of Operations - Russia.� He was responsible for supporting Russian-based training, logistics and administrative needs of NASA astronauts preparing for flight on the International Space Station.� Colonel Wheelock was the primary liaison between Star City and NASA operations in Houston, including medical, training, science, contracting, public affairs and administration departments.� He was also responsible for liaison duties between NASA and the Russian Space Agency as well as the Russian aerospace industry. Colonel Wheelock completed training in the NASA Extreme Environments Mission Operations (NEEMO) program, during a 10-day undersea mission aboard the National Undersea Research Center's Aquarius habitat.� Colonel Wheelock has flown aboard the space shuttle, the International Space Station and the Russian Soyuz TMA spacecraft.� He has accumulated more than 178 days in space and has conducted six spacewalks totaling 43 hours and 30 minutes.� His experience outside of the station includes four contingency spacewalks to repair a torn solar array and replace a failed ammonia pump module. SPACEFLIGHT EXPERIENCE:� STS-120 Discovery (October 23 to November 7, 2007) launched from and returned to land at Kennedy Space Center, Florida.� During the mission, the Node 2 module, Harmony, was delivered to the International Space Station.� This element opened up the capability for future international laboratories to be added to the station.� Wheelock accumulated 20 hours and 41 minutes of EVA during three spacewalks.� One of the major EVA mission objectives was the relocation of the P6 Solar Array from the top of the Z1 Truss to the end of the port side of the Integrated Truss Structure.� During the redeploy of the solar array, several array panels snagged and were damaged, requiring an unplanned spacewalk to successfully repair the array.� The American Astronautical Society's Flight Achievement Award was presented to the spacewalkers for demonstrating the importance of ingenuity and heroism in exploring space.� The mission was accomplished in 238 orbits, traveling 6.2 million miles in 15 days, 2 hours and 23 minutes. Soyuz TMA 23S Olympus/International Space Station Expedition 24/25 (June 15 to November 25, 2010) - Colonel Wheelock launched from the Baikonur Cosmodrome as a Flight Engineer on the Russian Soyuz spacecraft for a 2-day autonomous flight to the station.� He began his long-duration stay aboard the orbiting outpost as a Flight Engineer for Expedition 24 and then assumed command of the station and the Expedition 25 crew. �During Expedition 25, there were more than 120 microgravity experiments in human research, biology and biotechnology, physical and materials sciences, technology development and Earth and space sciences.� Colonel Wheelock also responded to an emergency shutdown of half of the station's external cooling system and was the lead spacewalker for three unplanned EVAs to replace the faulty ammonia pump module that caused the shutdown. His efforts restored the station's critical cooling system to full function. �For his actions during this challenging time, Colonel Wheelock was presented the American Red Cross 2010 Hero in Space Award, and the Fédération Aéronautique Internationale 2010 Yuri Gagarin Gold Medal Award.� The mission duration was 163 days and culminated in a parachute landing in the Olympus capsule in Kazakhstan. To date, Colonel Wheelock has accumulated more than 178 days in space. Born May 5, 1960 in Binghamton, New York and considers Windsor, New York to be his hometown. Married to the former Cathleen Hollen of Columbus, Georgia. They have one child. Recreational interests include coaching youth sports, baseball, hiking, flying, and collecting sports memorabilia. Doug's parents, Olin and Margaret Wheelock, reside in Windsor, New York. Cathy's parents, Jack and Judy Hollen reside in Enterprise, Alabama. Graduated from Windsor Central High School, Windsor, New York, in 1978. Received a Bachelor of Science degree in Applied Science and Engineering from the United States Military Academy, West Point, New York, in 1983, and a Master of Science degree in Aerospace Engineering from the Georgia Institute of Technology in 1992. Meritorious Service Medal (1st Oak Leaf Cluster); Army Achievement Medal (2nd Oak Leaf Cluster); National Defense Service Medal; Army Good Conduct Medal; Overseas Service Ribbon; Airborne Wings; Air Assault Wings; Senior Aviator Wings. Distinguished Graduate of the U.S. Army Initial Entry Flight Training Course (1984); 25th Infantry Division Flight Safety Award (1986 and 1989); Military Nominee to the U.S. Jaycees Ten Outstanding Young Men of America (1989); Veterans of Foreign Wars Outstanding Spokesman for Freedom (1990); Team Leader of the Georgia Tech Aerial Robotics Design Team (1992); Gamble Award for excellence in experimental flight testing and technical reporting (1995); NASA Group Achievement Award (Global Positioning System) (1997). Wheelock received his commission as a Second Lieutenant in the United States Army from West Point in May 1983. He entered the U.S. Army Aviation School, Fort Rucker, Alabama in 1984 and graduated at the top of his flight class and was designated as an Army Aviator in September 1984. Subsequently served as a combat aviation Section Leader, Platoon Leader, Company Executive Officer, Battalion Operations Officer, and Air Cavalry Troop Commander in the Pacific Theater (Hawaii, Korea and the Philippines). Following a successful command, he was assigned to the Aviation Directorate of Combat Developments, Fort Rucker, Alabama, as a Research and Development Staff Engineer. He earned a Master of Science degree in Aerospace Engineering from the Georgia Institute of Technology in 1992, having completed graduate studies and independent research in the areas of hypersonic and high temperature gas dynamics, flight stability and control, and automatic control and robotics. He was selected as a member of Class 104 at the U.S. Naval Test Pilot School and upon completion was assigned as an Experimental Test Pilot with the U.S. Army Aviation Technical Test Center (ATTC). With ATTC, his flight testing was focused in the areas of tactical reconnaissance and surveillance systems in the OH-58D(I), RU-21H and C-23. His tour with ATTC culminated with his assignment as Division Chief for fixed wing testing of airborne signal and imagery intelligence systems in support of the National Program Office for Intelligence and Electronic Warfare. He is also a graduate of the Army Airborne and Air Assault Courses, the Aviation Advanced Course, the Material Acquisition Management Course, and the U.S. Army Command and General Staff College. A dual rated Senior Army Aviator; he has logged over 2000 flight hours in 43 different rotary and fixed wing aircraft. Wheelock was assigned to NASA at the Johnson Space Center in August of 1996. His technical assignments with the Vehicle Integration Test Office (VITO) have included support engineer for Space Shuttle missions STS-81, STS-82, STS-94, STS-84 and STS-85 Terminal Count Demonstration Test (TCDT) and Launch Countdown (LCD) testing and vehicle preparation. He was selected as the VITO Lead Engineer for the joint U.S. Space Shuttle and Russian Space Station MIR mission STS-86, and Lead Engineer for International Space Station element-to-element hardware fit checks. Selected by NASA in June 1998, he reported for training in August 1998. Astronaut Candidate Training includes orientation briefings and tours, numerous scientific and technical briefings, intensive instruction in Shuttle and International Space Station systems, physiological training and ground school to prepare for T-38 flight training, as well as learning water and wilderness survival techniques. Following a period of training and evaluation, Wheelock will receive technical assignments within the Astronaut Office before being assigned to a space flight. Family: Astronaut. Country: USA. Spacecraft: ISS. Flights: STS-120, Soyuz TMA-17, Soyuz TMA-19. Agency: US Army. Bibliography: 12, 6193. 1960 May 5 - . Birth of Douglas Harry Wheelock - . Nation: USA. Related Persons: Wheelock. American test pilot mission specialist astronaut 1998-on. US Army. 2 spaceflights, 178.4 days in space. Flew to orbit on STS-120 (2007), Soyuz TMA-19..
2007 October 23 - . STS-120 MCC Status Report #01 - . Nation: USA. Related Persons: Anderson, Clayton, Melroy, Nespoli, Parazynski, Tani, Wheelock, Whitson, Wilson, Zamka. Program: ISS. Flight: Soyuz TMA-10, STS-117 ISS EO-15, STS-120. 2007 October 23 - . 15:38 GMT - . Launch Site: Cape Canaveral. Launch Complex: Cape Canaveral LC39A. LV Family: Shuttle. Launch Vehicle: Space Shuttle. STS-120 - . Call Sign: Discovery. Crew: Melroy, Nespoli, Parazynski, Tani, Wheelock, Wilson, Zamka. Return Crew: Anderson, Clayton, Melroy, Nespoli, Parazynski, Wheelock, Wilson, Zamka. Payload: Discovery F33 / Harmony / ISS-10A. Mass: 123,400 kg (272,000 lb). Nation: USA. Related Persons: Anderson, Clayton, Melroy, Nespoli, Parazynski, Tani, Wheelock, Wilson, Zamka. Agency: NASA. Program: ISS. Class: Manned. Type: Manned spaceplane. Flight: Soyuz TMA-10, Soyuz TMA-11, STS-117 ISS EO-15, STS-120, STS-120 ISS EO-16. Spacecraft Bus: Shuttle. Spacecraft: Discovery. Duration: 15.10 days. Decay Date: 2007-11-07 . USAF Sat Cat: 32272 . COSPAR: 2007-050A. Apogee: 344 km (213 mi). Perigee: 340 km (210 mi). Inclination: 51.60 deg. Period: 91.40 min. 2007 October 24 - . 2007 October 25 - . 2007 October 26 - . STS-120 MCC Status Report #8 - . Nation: USA. Related Persons: Anderson, Clayton, Nespoli, Parazynski, Tani, Wheelock, Whitson, Wilson. Program: ISS. Flight: Soyuz TMA-10, STS-117 ISS EO-15, STS-120. 2007 October 26 - . 10:02 GMT - . EVA STS-120-1 - . Crew: Parazynski, Wheelock. EVA Duration: 0.25 days. Nation: USA. Related Persons: Parazynski, Wheelock. Program: ISS. Flight: Soyuz TMA-11, STS-120, STS-120 ISS EO-16. The astronauts emerged from the Quest hatch at 10:01 GMT. They moved an antenna from the Z1 truss and stowed it in the payload bay, prepared the P6 truss for separation from Z1, and assisted in installation of the Harmony module, which was unberthed from the shuttle bay by the ISS Canadarm-2 and docked to the Unity module. 2007 October 27 - . 2007 October 28 - . 2007 October 29 - . 2007 October 30 - . STS-120 MCC Status Report #15 - . Nation: USA. Related Persons: Parazynski, Tani, Wheelock, Wilson, Zamka. Program: ISS. Flight: Soyuz TMA-10, STS-117 ISS EO-15, STS-120. 2007 October 30 - . 08:45 GMT - . EVA STS-120-3 - . Crew: Parazynski, Wheelock. EVA Duration: 0.29 days. Nation: USA. Related Persons: Parazynski, Wheelock. Program: ISS. Flight: Soyuz TMA-11, STS-120, STS-120 ISS EO-16. The astronauts emerged from the Quest hatch at 08:44 GMT. They assisted in the mating of the P6 to P5 trusses and deployment of a radiator from P6. Wheelock transferred a spare Main Bus Switching Unit (MBSU) from the Shuttle bay to the External Stowage Platform 3 (ESP3). P6 solar array wing 2B was successfully redeployed; but deployment of array 4B had to be halted when a tear developed in the solar panel. 2007 October 31 - . 2007 November 1 - . 2007 November 2 - . 2007 November 3 - . 2007 November 3 - . 10:03 GMT - . EVA STS-120-4 - . Crew: Parazynski, Wheelock. EVA Duration: 0.30 days. Nation: USA. Related Persons: Parazynski, Wheelock. Program: ISS. Flight: Soyuz TMA-11, STS-120, STS-120 ISS EO-16. The astronauts emerged from the Quest hatch and rode the ISS Canadarm II 50 m out to the snagged P6 solar array. Parazynski cut a snagged wire and installed homemade stabilizers designed to strengthen the array's structure and stability in the vicinity of the damage. Wheelock helped from the truss by keeping an eye on the distance between Parazynski and the array. Afterwards they observed as ground controllers completed successful extension of the array. 2007 November 4 - . 2007 November 6 - . 2007 November 7 - . 2007 November 7 - . 18:01 GMT - . Landing of STS-120 - . Return Crew: Anderson, Clayton, Melroy, Nespoli, Parazynski, Wheelock, Wilson, Zamka. Nation: USA. Related Persons: Anderson, Clayton, Melroy, Nespoli, Parazynski, Wheelock, Wilson, Zamka. Program: ISS. Flight: STS-117 ISS EO-15, STS-120. 2009 December 20 - . 21:52 GMT - . Launch Site: Baikonur. Launch Complex: Baikonur LC1. LV Family: R-7. Launch Vehicle: Soyuz-FG. Soyuz TMA-17 - . Call Sign: Pulsar. Crew: Creamer, Kotov, Noguchi. Backup Crew: Furukawa, Shkaplerov, Wheelock. Payload: Soyuz 7K-STMA s/n 227 / ISS-21S. Mass: 7,250 kg (15,980 lb). Nation: Russia. Agency: RKA. Program: ISS. Class: Manned. Type: Manned spacecraft. Flight: Soyuz TMA-17. Spacecraft Bus: Soyuz. Spacecraft: Soyuz TMA. Duration: 163.23 days. Decay Date: 2010-06-02 . USAF Sat Cat: 36129 . COSPAR: 2009-074A. Apogee: 351 km (218 mi). Perigee: 336 km (208 mi). Inclination: 51.60 deg. Period: 91.40 min. Docked with Zarya port of ISS at 22:48 GMT on 22 December. Undocked at 0:04 GMT on 2 June 2010 and landed in Kazakhstan at 03:25 GMT..
2010 June 15 - . 21:35 GMT - . Launch Site: Baikonur. Launch Complex: Baikonur LC1. LV Family: R-7. Launch Vehicle: Soyuz-FG. Soyuz TMA-19 - . Call Sign: Olympus. Crew: Walker, Shannon, Wheelock, Yurchikhin. Backup Crew: Coleman, Catherine, Kondratiyev, Nespoli. Payload: Soyuz 7K-STMA s/n 229. Mass: 7,200 kg (15,800 lb). Nation: Russia. Agency: RKA. Program: ISS. Class: Manned. Type: Manned spacecraft. Flight: Soyuz TMA-19. Spacecraft Bus: Soyuz. Spacecraft: Soyuz TMA. Duration: 163.30 days. Decay Date: 2010-11-26 . USAF Sat Cat: 36603 . COSPAR: 2010-029A. Apogee: 361 km (224 mi). Perigee: 350 km (210 mi). Inclination: 51.60 deg. Period: 91.60 min. ISS EO-24 crew. The return to earth was reported advanced four days to avoid coinciding with an OSCE conference in Kazakhstan. The crew undocked from the Rassvet module of the ISS at 01:23 GMT on 26 November 2010. There was a leak in the descent module, but ground controllers concluded the return to earth could be conducted safely. The Soyuz made its deorbit burn at 03:55 GMT and landed safely in Kazakhstan at 04:46 GMT. 2010 August 7 - . EVA ISS EO-24-2 - . Crew: Caldwell, Wheelock. EVA Duration: 0.34 days. Nation: USA. Program: ISS. Flight: Soyuz TMA-18, Soyuz TMA-19. Attempt to replace an ammonia pump module of the station cooling system on the S1 truss failed due to a quick disconnect being stuck..
2010 August 11 - . EVA ISS EO-24-3 - . Crew: Caldwell, Wheelock. EVA Duration: 0.31 days. Nation: USA. Program: ISS. Flight: Soyuz TMA-18, Soyuz TMA-19. Removed failed ammonia pump on the S1 truss and began installation of replacement..
2010 August 16 - . EVA ISS EO-24-4 - . Crew: Caldwell, Wheelock. EVA Duration: 0.31 days. Nation: USA. Program: ISS. Flight: Soyuz TMA-18, Soyuz TMA-19. Completed installation of replacement ammonia pump of the station cooling system on the S1 truss..